There is still time ... but just barely! You still have time to register for the CASE Fall Conference in Reno, NV where you can hear four (4) amazing keynotes and choose from over 40 breakout sessions! I promise you this is sure to be one of the best and least expensive ones you could attend this decade! Don't put off registering any longer! Kindel Mason (ID), CASE Professional Development chair and his committee have put together an amazing program! The 27th Annual CASE Fall Conference will be held at the Nugget in Reno, Nevada, Nov. 2-4. Now is a great time to go ahead and reserve you room at the Nugget at the amazing group rate of just $81 a night — and that includes your airport to hotel and back transportation! This will be an amazing professional development opportunity and at a much lower cost. The networking and practical information you will receive to take back to your district/school will be phenomenal! Hope to see you there! Special thanks to our Sponsors! We are always so appreciative of our very special vendors who support us so well! DOT.COM Therapy; Imagine Learning; Houghton, Mifflin, and Harcourt; LEArn & LEAd; Star Autism; Rethink Ed; PresenceLearning; The Conover Company; Catapult Learning; Stetson & Associates; Winsor Learning; TAI-Talent Assessments, Inc; CentralReach; Positive Action; and Exceptional Child have all made our Executive Committee, Board of Directors meeting, and the Conference better by partnering with us! Please say thank you to these companies by looking at and considering their services and products! Sometimes I am able to connect you with a great resource. I have been involved with the National Center for Intensive Intervention from the beginning and have shared various tools and information with you in the past. I am so excited about their newest resource, a new self-place interactive online learning module that introduces users to intensive intervention and data-based individualization (DBI), NCII's approach to intensive intervention. The module defines intensive intervention and DBI, describes how intensive intervention fits within a tiered system such as MTSS, RTI, or PBIS, demonstrates how intensive intervention can provide a systematic process to deliver specialized instruction for students with disabilities, and provides opportunities for users to apply new knowledge through two case example. One of the cases focuses on a student struggling with behavioral challenges while the second example illustrates a student struggling with reading. Throughout both cases, links to tools and resources that school teams can use to support implementation are provided. Users can choose to view one or both cases depending on their area of interest. Have you registered for CEC in Tampa, Florida, Feb. 7-10? For as long as I can remember, CEC has held its conference in April and for the last 15 years or so, it has conflicted with state testing programs! So, CEC leadership decided to move the conference to a time better suited for teachers and others connected with schools. The program will be amazing and this will be a conference you do not want to miss. Check out all the information from programs to hotels to workshops at the dedicated conference website. Speaking of the CEC Conference — CASE NIGHT tickets will be going on sale Nov. 1! We are so excited about this year's CASE Night — a dinner cruise on Tampa Bay! The boat will leave just steps away from the convention center so no added transportation. Tickets will be $65 but remember it is sponsored so for that amount, you are really getting an event that is worth much more! Our very special sponsors are Star Autism and Sonday System! The tickets are limited so mark you calendar and get your tickets at www.casecec.org starting Nov. 1. The question last week was "what are your plans for your district's fall break?" 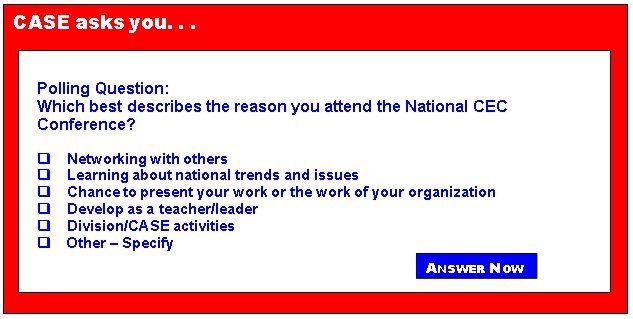 Unfortunately the number one answer for 55 percent of those responding was — work, I have no fall break! A distant second at 27 percent was visit with family and right behind that with 18 percent was travel. It is hard to believe but many districts take a full week for a fall break now. Some locations it is around the time of regional and state fairs. If you had a fall break, I hope it was great ... if you don't get one, I hope you still take some time to do personal "stuff" — it is so important to take a breather from your work so you can do your work better when you come back to it! Enjoy these last few days of October and don't forget to get your CASE Night ticket starting this Wednesday at www.casecec.org. Advocate for education investments for FY 2018! How far behind is Trump in staffing the Education Department compared to Obama? What's killing the joy of learning in our students with ADHD?